This post is sponsored by Bing. Try using Bing for your internet searches and take The Bing Challenge. 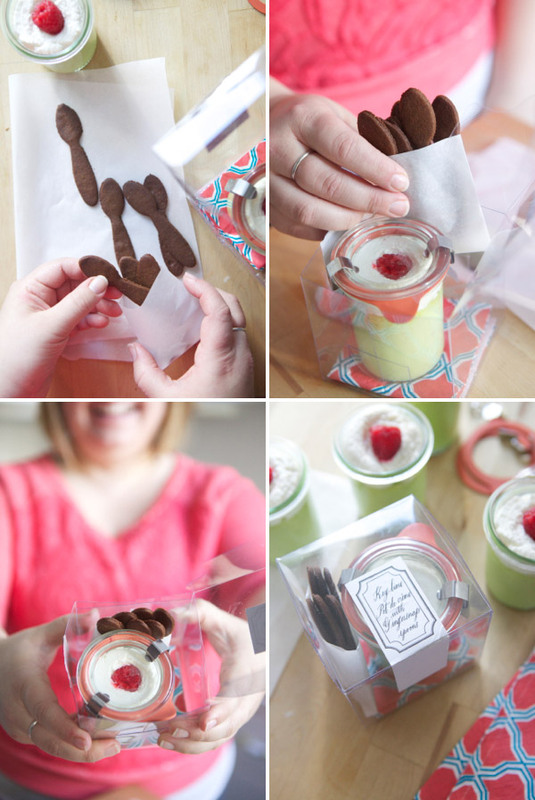 My friend Andrea came up with these wonderful pot de creme and cookie spoons for our Craft Night and we asked here to share how she did it. She developed a special recipe for this so that the cookie would stay crisp and would actually be functional when you dipped it in your pot de creme but would also taste delicious. Find all the directions below. Step 1: Roll out the dough between two sheets of parchment paper until it is very thin, about 1/16″ thick. Then place in the freezer for 10-15 minutes until chilled. Step 2: Using the spoon cookie cutter cut out the gingersnap dough and remove excess. Transfer to a baking sheet making sure the spoons are chilled and flat. Step 3: Bake at 325 degrees for 8-10 minutes. The cookies should be crisp not bendy. 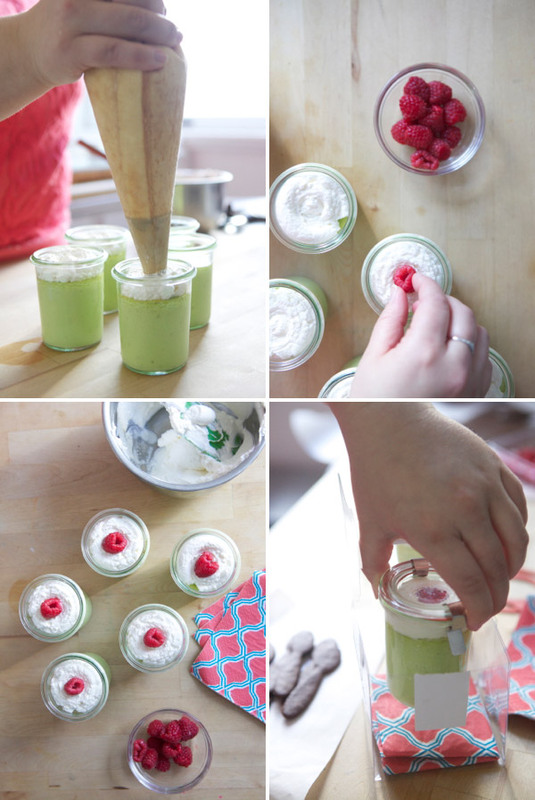 Andrea packaged the Pot de Creme in Weck Jars and then served envelopes of cookies spoons in clear cupcake boxes with the napkins folded at the bottom. All photos by Paul Ferney for Oh Happy Day. So creative! Every aspect of dessert sounds delicious, as well. Andrea is my hero!! And for the record, the best wedding caterer ever. Yum! This is such a cute idea! I love that it’s all packaged and ready to go. Very cute! Thanks for sharing Andrea! This looks so delicious and adorable! omg. brilliant! ahah, you can literally eat the spoon! the packaging is also very pretty. might actually get one, so much fun. I’m so glad you did this tutorial! I had see some on Martha Stewart and have had them on my ‘to bake’ list forever. But of course being in the wellness profession, I’m thinking whole wheat something is in order! This looks SO GOOD! I just want to eat them! Love your blog by the way!! This is one of those “why didn’t I think of that?” things. As a pudding fanatic I think this would make an amazing end to a meal. I will have to keep this in mind for christmas next year or many over the summer with some ice cream. Love love love this! 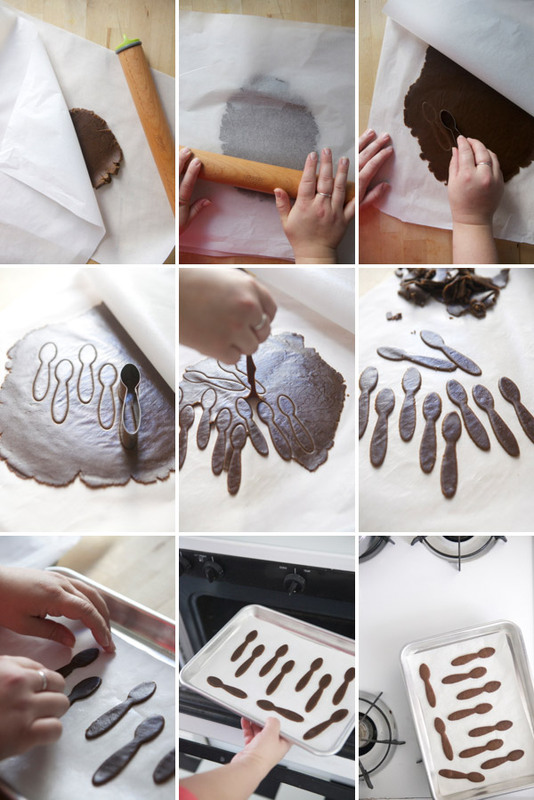 There are so many yummy ideas to use the spoons with as well. Maybe shovels for dirt cake?! this is (again) such a great idea!!!!! imagine being able to eat your own spoon after drinking hot chocolate haha wonderful photos by the way thanks! The cutest idea ever! Wow! Thanks. Those look DELICIOUS!! Such a clever idea. . . I need to do me some cookie-cutter shopping! This is the cutest thing I’ve ever seen! I am definitely going to make this. OMG this is to die for, so cute! What a fantastic idea. These look wondeful and would work so well for a gift! What a fabulous (and yummy!) idea! So prettily packaged, too! Oh wow! Thank you! This really amazes me! The concept is great and I have never seen this before. I have to try that! I think it’s a great idea for a gift. I can’t thank you enough for this. Wow! Lovely spoons and Yummy! These are adorable!! Perfect for any shower, kids party or picnic. Love! Oh yum! Cutlery that you can eat afterwards?! Amazing! Those are the cutest things I have ever seen!! I need to get one of those cookie cutters immediately. what a cute idea! I want to throw a party just to try it! 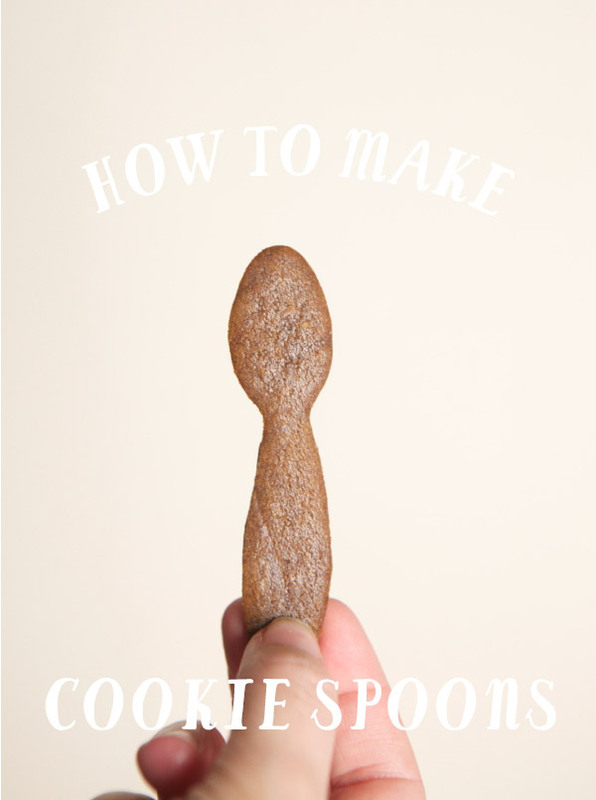 The first time I see spoon cookies, what a great idea. They match perfectly also with a cup of coffee…. Thanks for sharing!